August Wilson’s Pulitzer Prize winning play Fences has always caused a critical storm. When it premiered on Broadway in 1987 it scooped itself 4Tony Awards, including Best Play, its 2010 Broadway revival starring Denzel Washington won the show a further 3 Tony Awards and now the show makes its West End debut starring Lenny Henry. Fences is set in Pittsburgh America in the 1950’s as race relations are evolving in the US. The subject of the text is Troy Maxson, a man in his 50’s who has spent his working life as a bin man struggling to provide for his family, living from pay day to pay day. It is revealed that Troy was a talented baseball player in his youth but he never amounted to anything, possibly because of the colour of his skin. Troy appears to be a drunk who is wildly possessive of his wife and children, doing his best to keep them within the boundaries of his property, where the entirety of the shows action takes place. Troy spends much of the show trying to finish building a fence around his home, presumably to keep his family in and the outside world out. Troy is soon revealed as a hypocrite as roams in an out of the confines of the fences as he pleases. Similarly hypocritical is that Troy tries to stifle his son's inherent baseball ability, even though he spends much of the play mourning the loss of his own potential sporting career. 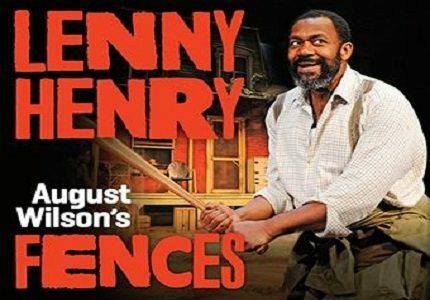 Following a successful run at the Theatre Royal Bath, Fences arrived at the Duchess Theatre in June 2013 with Lenny Henry as Troy, his first major role since he won Critical acclaim in the Royal National Theatre’s The Comedy of Errors in 2011. Fences contains foul language and scenes of a violent nature and is therefore not suitable for children. Teens may attend the show if accompanied by an adult.